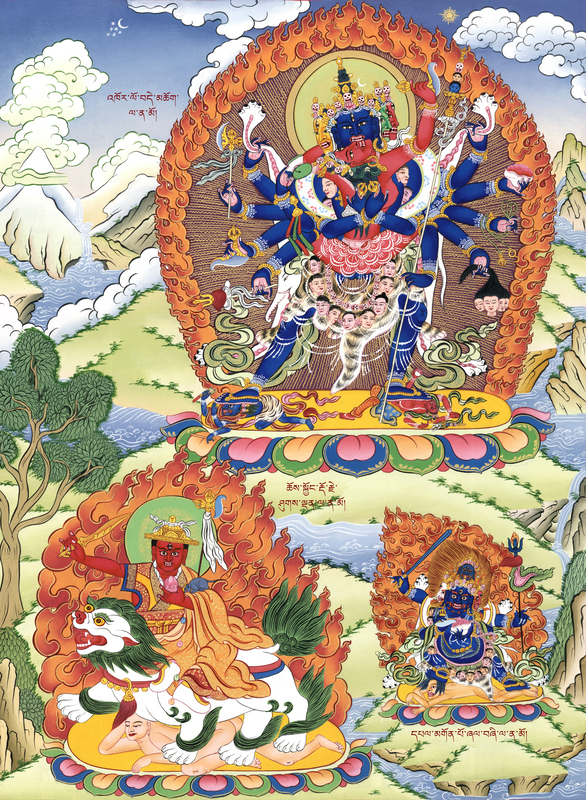 (Top to bottom): Heruka Chakrasamvara, Dorje Shugden and Four-Faced Mahakala. Heruka is the principal deity of the Chakrasamvara Tantras. He is a meditational Buddha of the Highest Yoga Tantra classification, which means that his practice has the potential to bring us directly towards enlightenment within one lifetime. Heruka’s practice uniquely utilises desire as a means towards achieving liberation from samsara or suffering. Heruka is also one of the main Tantras that most of the 84 Mahasiddhas of ancient India relied upon in order to gain their great attainments. 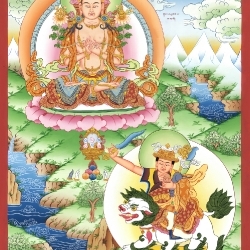 All schools of Buddhism treasure Heruka’s practice, including the Gelug School in which it is one of the main practices. The distinguishing iconographic feature of the form favoured by the Gelug School has both of Vajra Yogini’s legs wrapped around Heruka’s waist in an embrace of union. Four-Faced Mahakala is a Dharma Protector associated explicitly with the Heruka Tantras and is propitiated by Heruka practitioners for spiritual protection and for the granting of material necessities so that they can concentrate on their spiritual practice. Four-Faced Mahakala has a very close connection with Dorje Shugden. In his previous lives as great lamas and teachers, Dorje Shugden as a lama relied on Four-Faced Mahakala as one of his primary protectors.